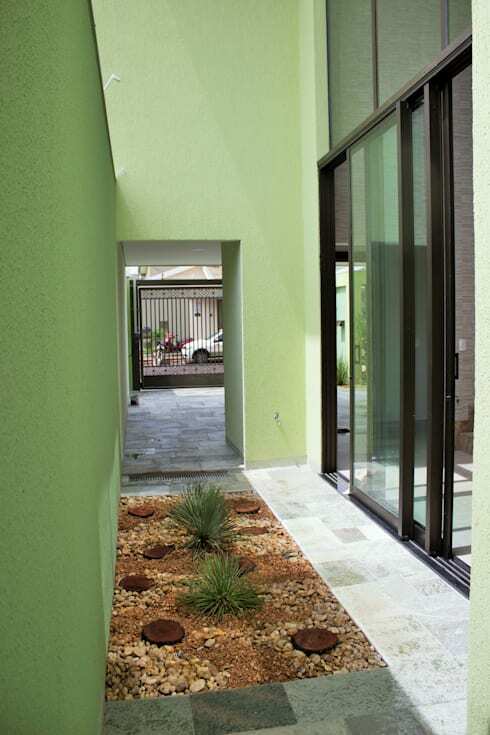 Today, we are going to visit a 440 square metre home, designed by architects PZ ARQUITETURA E ENGENHARIA and find out just how gorgeous green architecture can be. And no, today we aren't referring to eco-friendly architecture—the home is literally green! 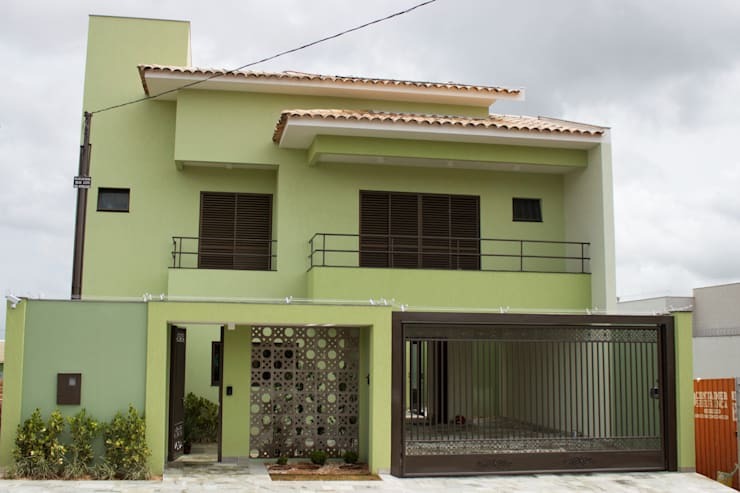 The pale green facade creates a home that is charming and vibrant, welcoming friends and family into it right from the get go. It also works in harmony with natural elements including stone, plants and flowers to create a beautiful ambiance from the outside in. The double-storey home features different volumes and layers throughout its shape, making for a very unique piece of architecture. The red tiled roof packages the home neatly below it while the green walls make for an interesting and refreshing look and feel. The dark wooden finishes add a modern touch. We can see how the home features a delicate combination of openness and security. 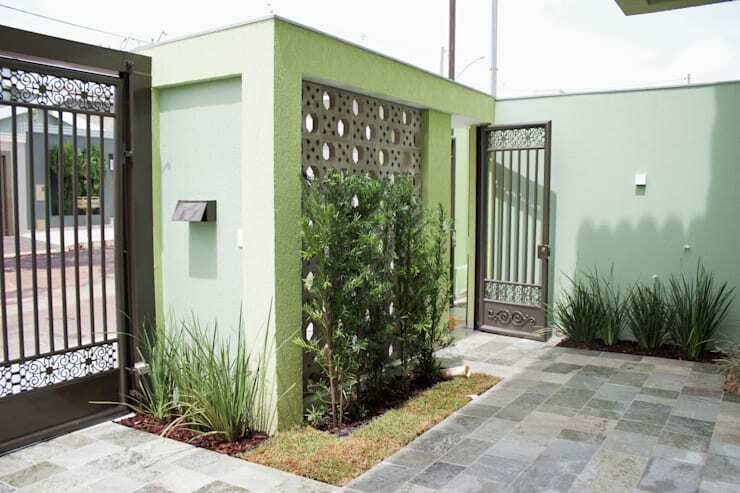 The large steel gate keeps the home protected while the detailed wall with patterned gaps in it ensures the home still looks open and welcoming. It's not just the walls that bring a green look and feel to the home. Here we can see how a small front garden connects the home to the natural surrounds. Plants and flowers are always a functional way to decorate an exterior (or interior) space. When in doubt, natural beauty is the best type of beauty. The small front courtyard welcomes guests, family and friends onto the property. In this image, we can see how you don't need a big garden to make for a stunning space. Have a look at these tips: Making a big impression with a small front garden. 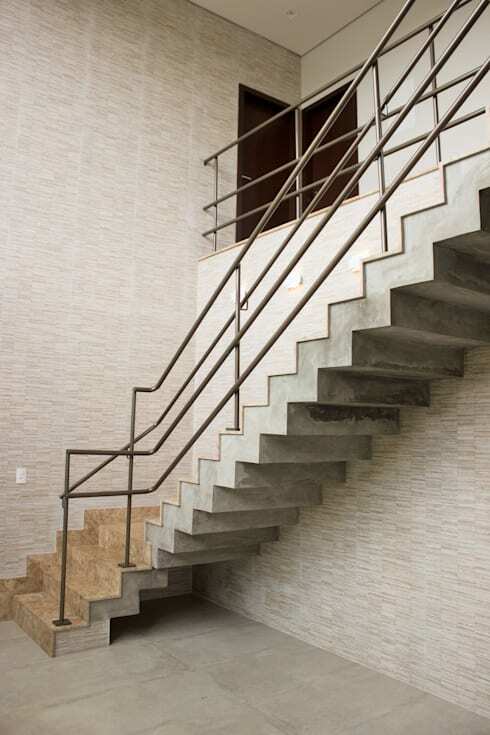 If we move into the house, we can see how a functional element, such as the staircase, can also bring design and decor to the home. With its clean lines, geometric handrail and sandy-beige tiles, this area of the home needs little else in terms of design and decor. Have a look at these 13 staircases you have to see to believe for ideas! A charming home isn't complete without a contemporary cooking space where you can whip up a feast for family and friends! 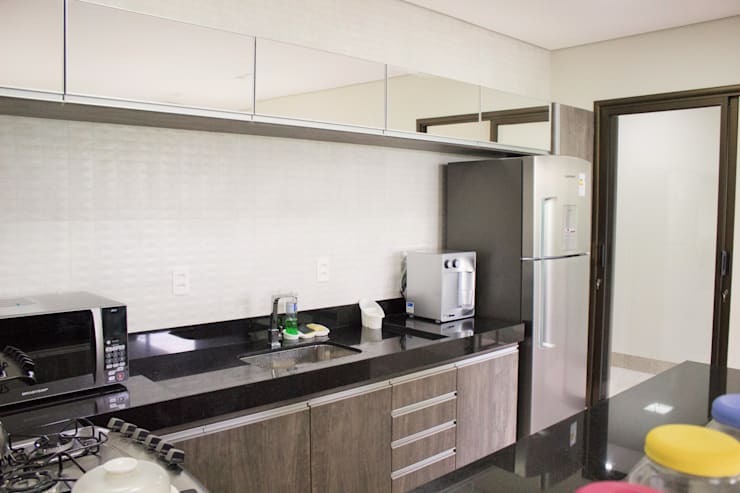 Here we can see how the designers have chosen sleek black counters with light wooden cabinets, making for an elegant and sophisticated design. There is also plenty of storage underneath the cabinets and on the walls, keeping cutlery, crockery and utensils neatly out of sight. An organised kitchen is a happy kitchen! A small bathroom doesn't mean a bathroom that is cramped or crowded. 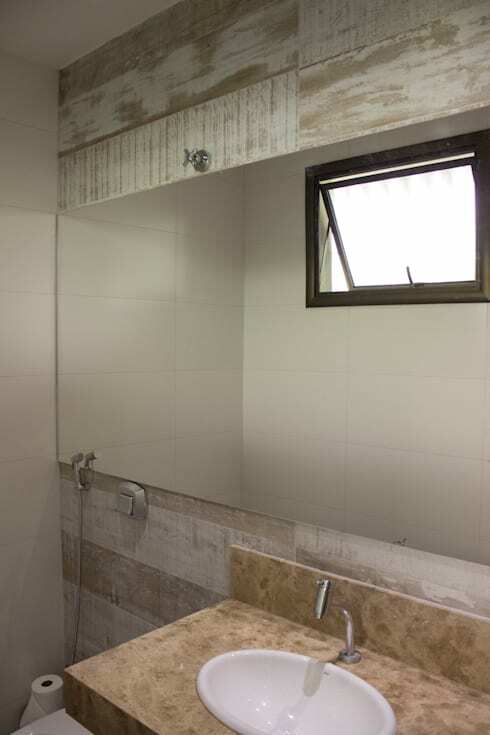 In fact, in this image we can see how a large mirror makes the bathroom feel spacious and expansive. The neutral tones ensure that the room looks warm and tranquil, creating a little oasis of relaxation and comfort. Do you see how natural light flows in through the little window, without compromising on privacy? Wood is always a wonderful element, introducing a rustic touch to a space. Here we can see how well it works in the bathroom. 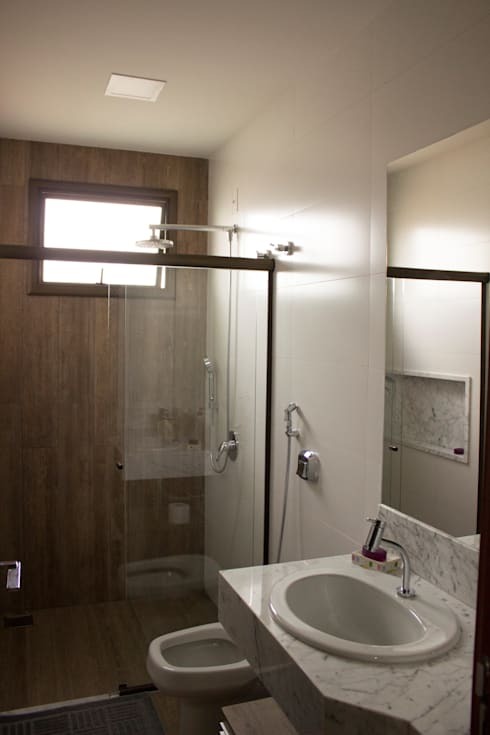 The wooden wall contrasts beautifully with the sleek glass shower and modern bathroom finishes. Tip: If you opt for wood in your bathroom, make sure that it is sealed so it isn't damaged by moisture. Before we say goodbye to this house, we just want to show you this low maintenance front garden made of stones and plants. It injects this outdoor space with a refreshing and natural touch of beauty, without overwhelming it. What's more is that it requires little effort. Have a look at these tips for how to make a beautiful garden in a small space to see how you can achieve a similar look and feel. Would you choose green for your home?